Dimensions (HxWxD): 2" x 2" x 2"
We have finally received some new & fabulous crystal bowls from our supplier in India. These Amazonite bowls are particularly pretty & we're so pleased with the way they turned out. Each one averages 2" in diameter & may vary very slightly in appearance from the photos here. However, you will find that these photos quite adequately portray the beauty & color of these lovelies! I like to use Amazonite for any purpose connected to the heart chakra, for clarity of purpose, ability to speak up for myself or to help new clients. 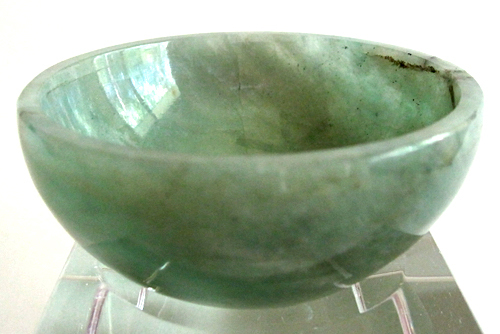 This bowl in a treatment room, on a shelf or to hold small crystals would be a welcome addition to a meditation practice, a healing practice or just to beautify your home. I also find it very soothing just to sit & look at this beauty. Another good use would be to place it on top of a covered jar of water to charge it up with the energy signature of Amazonite. Amazonite is a form of feldspar and so shares in those qualities as well. Amazonite is a mineral which is soothing to the emotional body, soothing the nerves by eliminating aggravation and dispelling negative energies. It is soothing to all chakras, especially the heart and throat, and because of it's blue-green color it is very helpful in communications of all kinds. Because this stone is very balancing to the etheric, astral and physical bodies, it is a wonderful stone for healing, for balancing male and female energies, and as a preventive stone. Working with the blue green of this lovely stone will also facilitate communication through the powerful lens of the compassionate heart. Another wonderful use to which we put these treasures, is to use them to make gem elixirs, either in the morning dawn, infused in moonlight or even in the sun, depending on the purpose to which you are putting the elixir or using the method described above. Note: Average weight is 1.65 oz. Average dimensions listed above. Each piece is unique and may vary in coloration and markings. Each piece is guaranteed to be beautiful & to meet with your complete satisfaction!